Converting the immense power of our oceans into reliable electricity to light our cities, fuel our travels, and make our homes habitable is one of the great engineering challenges of our time. A beguiling array of wave-energy devices, tidal turbines, and coastal-barrage proposals are in the works to meet this challenge, but the prospect of them competing with wind and solar power is a distant one indeed. That’s because the realities of designing, building, and deploying these devices are incredibly complex. Power-conversion devices that use blades, turbines, and other hardware to capture the kinetic energy of moving seawater and flowing rivers and convert it to a stream of usable electricity. Cables to transmit power from the devices to the mainland and sometimes are also required to hold these devices in place. Cable accessories to connect cable arrays and devices to efficiently transmit the generated power and extend their capabilities. Moorings that anchor devices to the sea floor via cables, ropes, or chains. All this equipment must work together, and failure of any one component can bring the whole system down. Ocean-energy device costs remain extremely high because there are no benefits of manufacturing at scale. Each device has to be painstakingly designed, constructed, and tested in laboratories, then turned into prototypes to be tested in actual ocean waters. The long process of trial and error requires funding to survive. Right now, a lot of funding is coming from governments because private companies don’t see much chance of getting a strong return on their investment. There are at least a dozen or more promising devices for capturing the motion of waves and the rise and fall of tides. 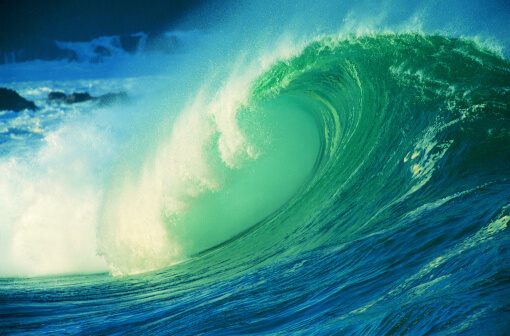 With wave energy, devices can move up, down, and side-to-side, generating motion that can be converted into electricity. But because the motion of waves is affected by surface winds, weather, and local topography, wave action is highly idiosyncratic and difficult to capture reliably. Furthermore, an ocean-energy device that works great in one locale might be terrible in another, making it difficult to develop a standard design. One project uses devices that look like wind turbines, except they’re mounted underwater. Another project uses a gigantic metal water wheel with blades that spin from the motion of advancing and retreating tides. Each of these proposed ocean-energy devices is intriguing in its own right, but there’s still a sharp contrast with offshore wind, where there’s a strong consensus on the most viable technology and a track record of which devices work best. Any large mechanical device placed into an active ocean ecosystem is going to be problematic. Spinning blades may injure or kill aquatic species. A coastal barrage for tidal energy might upset an entire estuarial ecosystem. Mechanical devices also can leak lubricants and emit noises that make trouble for fish and aquatic mammals. Engineers can tweak their designs in an attempt to minimize environmental damage, but they really can’t be sure what will happen until they get their prototypes in the water, so it’s difficult to solve these problems on the drawing board before they become much more expensive. Though waves splash endlessly against the coastline, their frequency and amplitude shifts constantly because wind has so much influence on water at the surface. Rough conditions are often a good thing for these devices because it means more motion, thus more energy created. But electricity users require a regular, reliable energy stream — not one that changes every time a low-pressure system moves in. This is why battery storage is being considered in some cases. Hurricanes, tsunamis, typhoons, and other calamities pose a realistic risk of destroying equipment in an instant, while day-to-day crashing of the seas wears equipment out over months and years. Either way, engineers have to build incredibly robust machinery to survive the whims of weather because these devices are going in high-energy locations that have previously been avoided by subsea cable and construction projects. Even wind power installations still face some of these same demanding issues, as they are not unique to tidal energy. Devices strong enough to convert waves into energy typically require the strength of metal alloys. The trouble is that saltwater is so corrosive to tough, economical alloys like steel. That requires an extra level of care at the design, construction, and installation phases to fend off the effects of corrosion. Admittedly, there are many metallic alloys that have amazing corrosion resistance, but building entire energy arrays out of these metals will be inherently costly. And then there are the creatures that attach themselves to anything we put in the ocean. Small animals and plant life can attach to the moving parts of underwater devices, creating potential for costly breakdowns and maintenance. The challenges of ocean energy equipment are no reason to give up and move on. This is especially true in light of news that a commercial-scale tidal-energy project in Scotland got the green light for development in June 2017. Obviously, offshore wind will be the most productive marine-energy source for the foreseeable future, but as long as the oceans keep moving, engineers, researchers, inventors, and entrepreneurs will be scouting for ways to bring tidal and wave energy into the mainstream. One thing’s for sure: The ocean-energy industry will need tough, long-lasting cable accessories to solve the attachment, transmission, and cable repair part of this puzzle. PMI is your premier resource for those cable accessories.